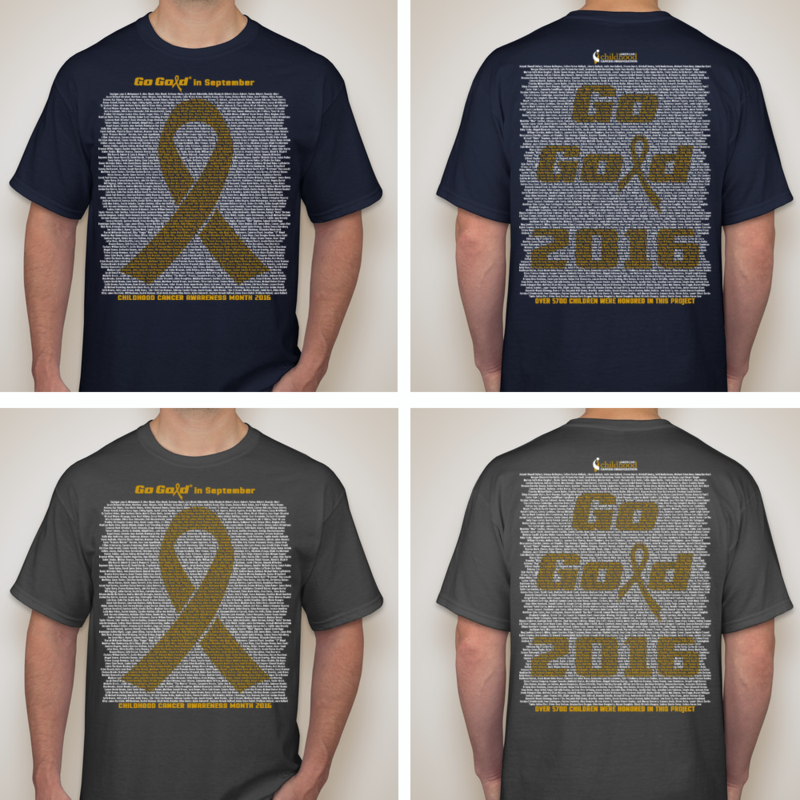 Purchasing for the 2016 Go Gold® Childhood Cancer Awareness Month Shirts closed on Monday, September 12th. The American Childhood Cancer Organization is honored to share our 2016 Go Gold® Awareness Shirt Campaign. Ordering for this shirt has closed, but we are getting ready to start collecting names for our 2017 ICCD shirt. Please Click Here or click the button below to submit a name for the next shirt. This year approximately 5,700 names of children and teens who have fought cancer or are still fighting cancer were submitted. The names we collected are in honor or in memory of children diagnosed with cancer, and represent so much more. They represent too many children, teens, and families who have faced a diagnosis of childhood cancer with courage and determination. HOW CAN YOU HELP RAISE AWARENESS THIS SEPTEMBER? WHY GOLD FOR THE GOLD RIBBON? Since we received approximately 5,700 names, we had to divide them onto four different shirts. Names are in alphabetical order by last name or initial. For siblings, cousins or friends, the names have been placed together in order to print on one shirt upon special request, however a duplicate of that name will also be in alphabetical order for those who submitted the name separately. If you have sent a special request for this, please check the list to see if the names are together. If you sent a special request for this, please check the list to see if the names are together and what shirt they are on. All edits and additions that were received before the deadlines of August 3rd, 2016 have been added to the master list. Please be sure to check the additional tabs at the bottom of the list to see what shirt your requested addition was added to. Please email cperry@acco.org with edit requests and/or questions. Please note that the list(s) is complete and contains ALL submitted corrections. Names used in the design thumbnail is not the actual list. The final list, with all edits and additions has beed updated and loaded to the document for review. Absolutely no further changes can be permitted for this run. We’ve collected names on a per project basis and did not carry names over from project to project. If your child’s name is on this shirt or previous shirts, but you would like their name to be on the 2017 ICCD that will go on sale in January 2017 for International Childhood Cancer Day (February 15, 2017), please submit their name again using this link or the button below. Please note, starting on the 2017 ICCD campaign, we now have the option to carry names over, so please type “Yes” or “No” for the question “Save Name for Future Projects” on the submission form. We will only be collecting names using this link to help streamline the process. Shirts ship only after the campaign ends, and usually require approximately two weeks for delivery. Please note we are also now able to ship internationally to: Australia, Canada, China, France, Germany, Ireland, Italy, Malaysia, Spain and the United Kingdom. Our goal is to have the shirts delivered to everyone by Childhood Cancer Awareness Month, September 2016, for you to wear to help raise awareness. We ask that you please try to wear your shirt as much as possible during this month, take a photo and email it to cperry@acco.org or share on our Facebook Page so that we may share the photo in our 2016 Go Gold Awareness Shirt Photo Album on website and our social media. We sincerely thank everyone who has submitted a name, plans on submitting a name and for those who are going to purchase a shirt to help raise awareness on International Childhood Cancer Awareness Month, September 2016. The proceeds from this purchase will go towards providing quality free resources designed for children and families who are fighting or have fought childhood cancer, to coordinating local assistance and to leading national and international advocacy campaigns for greater awareness and more research. To learn more about ACCO and what we do, please visit our Home Page.